BULLHEAD CITY–-Students from Mohave High and Bullhead City Middle School will honor area veterans with special ceremonies on Thursday, Nov. 8. 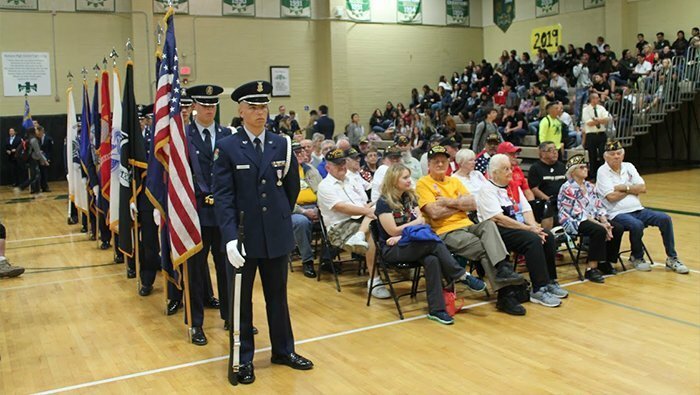 The Veterans Day assembly at Mohave High School has been in place for a number of years; it will be the first time for Bullhead City Middle School, previously Bullhead City Junior High School. On both campuses, current and former members of the military will be recognized by service branch. Mohave’s ceremony also includes special recognition for the area’s World War Two vets in the audience. The guest speaker for Mohave’s assembly is former Laughlin Town Advisory Board member Pamela Walker, who retired from the U.S. Air Force after 21 years of active duty. Walker was a mechanic, a flight engineer, pilot and flight instructor. She served in Operation Desert Storm and Operation Desert Shield. Walker also managed a team responsible for training NASA employees. She holds an associate degree in flight engineering, a bachelor’s degree in education, and a master’s degree in computer resources management and human resources development. Area veterans are invited to both, which will have slightly different focuses because of grade levels. Mohave High School’s ceremony will start at 10 a.m., while the Bullhead City Middle School’s starts at 1:30 p.m, AZ time. Each will last about an hour. Both programs will also feature demonstrations by members of Mohave’s Air Force Junior ROTC and the school choirs performing the national anthem. Veterans and student council members will jointly lead the pledge of allegiance at Bullhead City Middle School. At the Middle School’s assembly, veterans and students will have an informal question and answer opportunity as students leave. The school will host veterans to a reception afterward. Additional information is available from Mohave High School at 928-758-3961, and Bullhead City Middle School at 928-758-3921.